This is a plain white version of our favourite little product demonstrator, the Whizzy. It boasts similar features to its graphic namesake – being light to carry, easy to put together without tools and having an internal shelf. 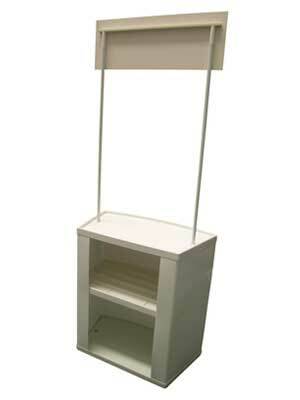 Price: £81.99 Price includes plain white counter, header, poles, internal shelf and carry bag.